Georgia Roche is in the England Performance squad. Dewsbury will have three representatives in the 32-player England Women’s National Performance Squad. Former Thornhill Trojans stand-off Hanna Butcher is included for the first time and is one of five new players included in head coach Craig Richards’ squad. Butcher played a vital part in the Rhinos League Leader’s campaign in 2018 and played in their Women’s Challenge Cup Final victory and also their Women’s Super League Grand final loss to Wigan Warriors. She is one of four Rhinos players selected in the Performance Squad, which includes Dewsbury lass Caitlin Beevers, who began playing for Birstall Victoria before moving to Dewsbury Moor. 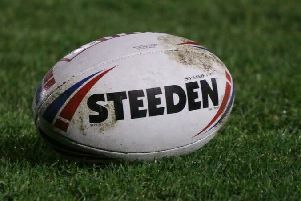 Last year’s Super League woman of steel Georgia Roche, who also featured for Dewsbury Moor, is one of eight Castleford Tigers players selected in the squad. Beevers and Roche were part of the England squad who beat France in October and all 20 players that travelled for that international are also included. England Women’s National Performance Squad: Savannah Andrade (Bradford Bulls), Amy Hardcastle (Bradford Bulls, Siddal), Leah Jones (Bradford Bulls, West Leeds Eagles), Grace Field (Castleford Tigers, Oulton Raiders), Kelsey Gentles (Castleford Tigers, East Leeds), Shona Hoyle (Castleford Tigers, Ovenden), Rhiannion Marshall (Castleford Tigers, Stanningley), Sinead Peach (Castleford Tigers, Castleford RUFC), Tamzin Renouf (Castleford Tigers, Castleford RUFC), Georgia Roche (Castleford Tigers, Dewsbury Moor), Tara-Jane Stanley (Castleford Tigers, Chorley Panthers), Andrea Dobson (Featherstone Rovers, Oldham St Annes), Katie Hepworth (Featherstone Rovers, Stanningley), Dannielle Anderson (Leeds Rhinos, Oulton Raiders)Caitlin Beevers (Leeds Rhinos, Birstall Victoria ARLFC), Hanna Butcher (Leeds Rhinos, Thornhill Trojans), Amy Johnson (Leeds Rhinos, Stanningley), Leah Burke (St Helens, Thatto Heath Crusaders), Chantelle Crowl (St Helens, Crosfields), Jodie Cunningham (St Helens, Thatto Heath Crusaders), Faye Gaskin (St Helens, Chorley Panthers), Tara Jones (St Helens, Thatto Heath Crusaders), Emily Rudge (St Helens, Thatto Heath Crusaders), Victoria Whitfield (St Helens, Crosfields), Naomi Williams (St Helens, Thatto Heath Crusaders), Michelle Davis (Wigan Warriors, Firwood Waterloo RUFC), Rebecca Greenfield (Wigan Warriors, Wigan St Patricks), Vanessa Temple (Wigan Warriors), Rachel Thompson (Wigan Warriors, Thatto Heath Crusaders), Georgia Wilson (Wigan Warriors, Preston Grasshoppers RUFC & UCLan), Ashleigh Hyde (York City Knights, New Farwick All Blacks), Daisy Sanderson (York City Knights).